At this moment in the investment universe, you can buy international oil explorers for one-tenth the price they were five years ago. 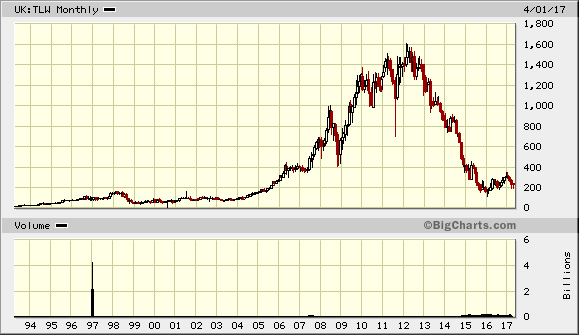 Here is a long-term chart of Tullow Oil Plc (LSE: TLW). In 2007, Tullow found 3 billion barrels of oil at the Jubilee Field off Ghana. The stock went from 100 pence to 1,600 pence. Today, you can buy it for 239 pence. Tullow produces about 70,000 barrels of oil a day from 67 wells in 25 countries. It has 1.2 billion in group reserves. It is an excellent driller with a 72% strike rate, which is about double the industry average. This stock is vastly undervalued because the market believes the price of oil will never go up. The market is wrong, and I'll tell you why. Oil speculators will point to the storage glut and say prices will drop. However, this glut won't hold up. It's true we are above the five-year average in storage, but we are also seeing the seasonal refinery slowdown affect those numbers. That's about to change now that refinery runs are picking back up. Refinery throughput so far this year has an average run rate of some 650 [thousand barrels a day] lower than levels seen this past December. Ultimately, softer refining margins and seasonal maintenance have contributed over 54 mb (million barrels) to storage so far this year. Simply put, if refiners had continued to run, throughout Q1, as hard as they did back in December, 54 mb of additional crude would have been consumed rather than stuffed into storage. Under that scenario, stock builds on a year to date basis would be minimal. U.S. crude oil production averaged an estimated 8.9 million barrels per day (b/d) in 2016. U.S. crude oil production is forecast to average 9.2 million b/d in 2017 and 9.7 million b/d in 2018. EIA forecasts Brent crude oil prices to average $55/b in 2017 and $57/b in 2018. Implied global petroleum and liquid fuels inventories increased by an estimated 0.5 million b/d in 2016. 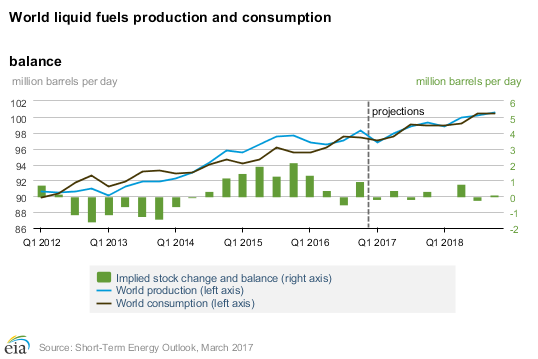 EIA expects a relatively balanced oil market in the next two years, with inventory builds averaging 0.1 million b/d in 2017 and 0.2 million b/d in 2018. Consumption is moving up. Unemployment came out at 4.5% — those people are driving to work. Manufacturing is also up. And the amount of gasoline in storage has been dropping much faster than in recent years. It is now below the five-year average. This, coupled with driving season, will pull down crude stores. As you can see by the chart below, after a six-year slowdown, miles driven is back up. Furthermore, those miles are being driven by pickup trucks and SUVs, not econoboxes. The EIA reported that global consumption of oil and other liquids was 96.64 million barrels per day in 2016 and would increase to 99.74 million barrels a day in 2017. China is the world's second-largest consumer of oil. China's GDP growth is at 6.3%. Its oil demand grew at 5.3% in the first two months of 2017. The EIA is a good place to go for facts, but it is often wrong on its oil price projections because it can't predict events, and it is events that drive oil. These range from embargoes to OPEC cuts, wars, and accelerating economies. For example, Libya lost 250,000 bpd of production recently due to its ongoing civil war, and the price of oil jumped to the mid-$50s. One price catalyst will be when OPEC meets on May 25. It is very likely that it will extend its production cuts. As I've said before, Saudi Aramco will go public in early 2018. It will be the biggest IPO in history at $1.2 trillion. It is being listed by a cabal of the top global investment houses. Furthermore, upstream investment has been slashed over the past three years, and it is unlikely that there will be a big rebound in spending with oil at $54 because many lenders took a hit three years ago. And even if there were a large boost in upstream spending, it would take years of development to replenish the oil we will need by the end of the decade. In the end, oil is a bullish story and will move up on global demand and reduced supply by OPEC. There are many beaten-down, independent explorers out there that will launch when oil jumps to $75 a barrel — a price viewed as cheap not too long ago. The dollar is falling. Energy and Capital editor Christian DeHaemer tells you should sell your dollars and stock up on gold. Energy and Capital editor Christian DeHaemer tells you why and how the Fed is going to get you... again. Venezuela has been in collapse for a long time, and things are finally coming to a head. Christian DeHaemer tells you how what's happening in Venezuela can happen here.